Abstract : Developable materials are ubiquitous in design and manufacturing. Unfortunately, general-purpose modeling tools are not suited to modeling 3D objects composed of developable parts. We propose an interactive tool to model such objects from a photograph. Users of our system load a single picture of the object they wish to model, which they annotate to indicate silhouettes and part boundaries. Assuming that the object is symmetric, we also ask users to provide a few annotations of symmetric correspondences. The object is then automatically reconstructed in 3D. At the core of our method is an algorithm to infer the 2D projection of rulings of a developable surface from the traced silhouettes and boundaries. We impose that the surface normal is constant along each ruling, which is a necessary property for the surface to be developable. We complement these developability constraints with symmetry constraints to lift the curve network in 3D. 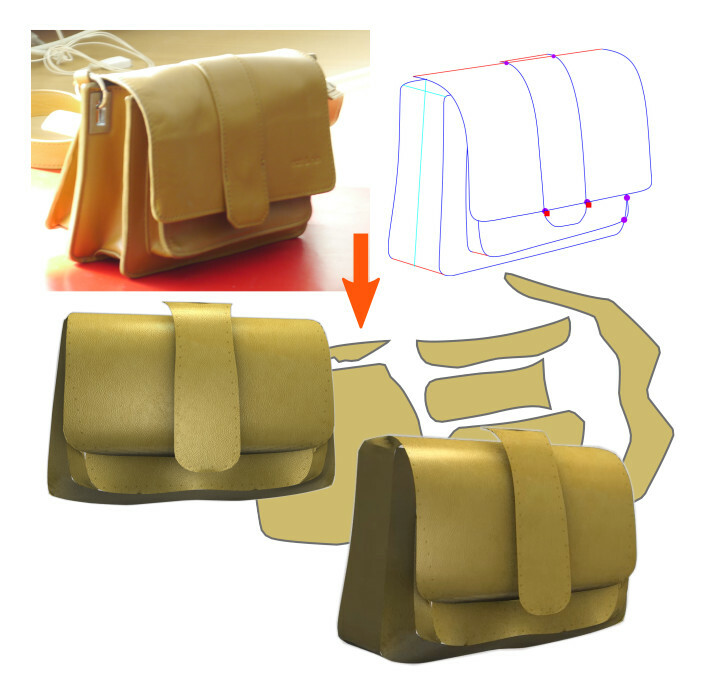 In addition to a 3D model, we output 2D patterns enabling to fabricate real prototypes of the object on the photo. This makes our method well suited for reverse engineering products made of leather, bent cardboard or metal sheets.